This Wednesday, mASSBackwards posted a picture of a gun on his wish list. His post inspired me to show off a similar gun. Meet Feather, so named because she only weighs 12 ounces when empty. When you pick her up, you expect to feel a lot more weight. Instead, she seems to leap from the counter. Feather is one of my carry guns. I bought her in June of 2002 when I lived in Massachusetts and I acquired her from Four Seasons Firearms, which was Bill's and my favorite gun store when we lived in that state. 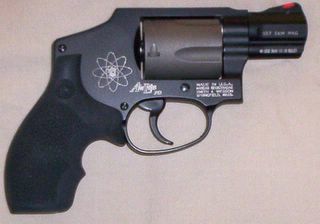 Denise's Smith & Wesson Model 340PD. Feather is made of a space-age metal, scandium. Actually they use a little scandium in an alloy with aluminum. The scandium changes the grains in aluminum making it stronger and less subject to metal fatigue (click for more information). Feather's cylinder is made of titanium. She has the factory grip made by Hogue. In an earlier post, I mentioned that I like guns with a lot of recoil. I have shot pistols chambered in .44 Magnums .357 Magnum, .30 M1Carbine, .500 S&W Magnum, and enjoyed every shot. Feather is chambered in .357 Magnum. Full of confidence, I took her to the range with a box of .357 cartridges. I loaded the five chambers in the cylinder, aimed and pulled the trigger. Sweet Jesus, Ow. My God, a jet of flame came out of the cylinder gap an inch from my hand. A larger burst of fire blew in all directions from the muzzle. The grip hammered my hand. 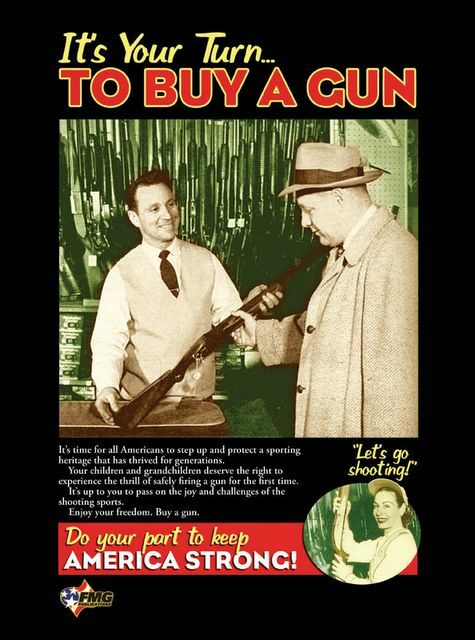 I wondered for a moment if the gun had blown up. Nothing could feel that bad on purpose. Nope, everything was fine. After checking my target (I hit the ten ring with that first shot), I shot the next round. OH. MY. GOD. It hurt worse. I fired the next round. I emptied the cylinder. I put Feather down and stared at my hand. My palm had red imprints left by the grip. I soldiered on and loaded five more. I put on a thin leather glove (not a shooting glove). The glove helped, but my shot group was getting more and more scattered--fewer ten rings. I went through 35 rounds and with each shot I almost whimpered like a little girl. I faced Recoil and I was bested. Now, I rarely shoot .357 in Feather. I load her with .38+P and enjoy shooting those. Feather is proof-positive that physics will not be denied. For every action there is an opposite and equal reaction. And, an object at rest will stay in rest unless acted on by some force. A heavy gun simply has more inertia and dampens felt recoil. A light gun lets you feel all that lovely recoil. In Feather you can't use a bullet weighing less than 120 grains. The recoil can "pull" the bullets right out of the brass in the other chambers. So, that is Feather. A remarkable little gun made out of a wonderful metal. Just wear a good quality padded shooting glove when you shoot .357 ammo out one of her litter-mates. Jay (of North Georgia Dogma) let me shoot his a while back at the range. Both with 38 Special and .357 magnum rounds. Christ almighty. That thing nearly flew out of my hand! But hey, if you miss your target, or fail to stop him with one shot, at least you'll set his clothes on fire with the muzzle blast. Wow, I put up a wheelgun post just yesterday. My concealed carry revolver is a Ruger SP-101...a bit heavier than yours, but after the 5th shot, you can throw it and do some damage. I too wanted to cry from the pain after my first cylinder full of heavy magnums...but I did find a load I like: Corbon makes a speedy load with a light (IIRC) 125 grain JHP bullet that my slender wrists can handle. Give 'em a try! A Gunnies' Paradise in Massachusetts!!!?? ?